Looks like I am bound to troubleshoot and maintain more today. But since that’s the case, I am having a chance to revisit what I have done while installing and configuring the current GP + CRM + Adapter + WebServices. Having said that, I just cleared one issue and thought I would share post it. When we install GP Web Services, a Local User Account called DynamicsGPAdm will be created and it will be added to IIS_WPG and IIS_IUSRS group. It was all fine till I found that the Dynamics Security Console did not show the necessary details. All I was seeing is a big red X error message and with that a message saying “Console is corrupted or invalid data, blah blah blah…”. Honestly, I was extremely scared to see this, as I was under the impression that everything was fine. I still believe everything was fine, because my GP10-CRM4 Adapter is working as good as it was for the past 2 months. I had to revisit what I had done to install and checked all IIS Security & Services Security. Everything was perfect till I saw one glaring gap. 1. This account has to change it’s password when it logs on to the server for the first time. (Never happened till date). 2. Password expires in such-and-such days. (The number of days had in fact exceeded in this case). 3. Must meet the Password Requirements. (It obviously didn’t). Perfect. I kinda hit it on the nail this time. 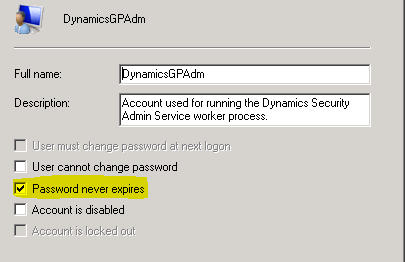 Just make sure that once you install Web Services, the DynamicsGPAdm must be configured as above. Significance of DynamicsGPAdm: This is the account which is configured in the Identity of DynamicsSecurityAdminServiceAppPool IIS Application Pool, which is the base for Dynamics Security Service and Console.